Sometime I get frustrated when I asked my family or friends what they want to eat; the usual answer is… anything, up to you. Hello! What is anything??? Please decide and don’t waste time. 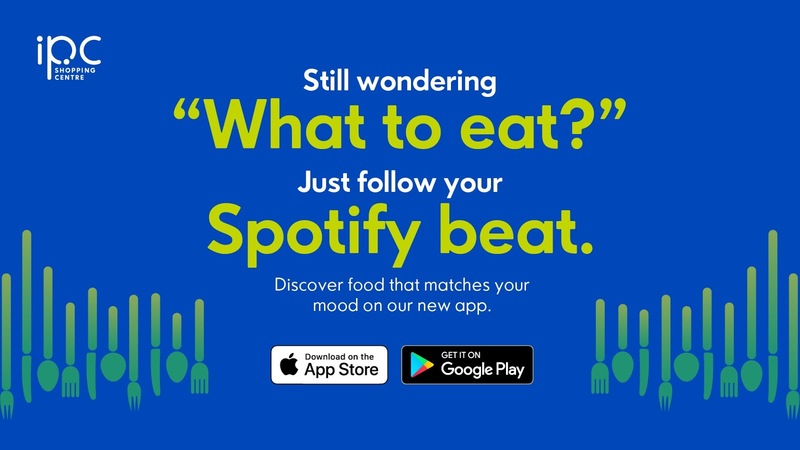 But recently I found a solution for this dilemmas, The Mood Menu App by IPC Shopping Centre that combines science and music to solve our thought dilemma “What To Eat?” Let’s test it out! 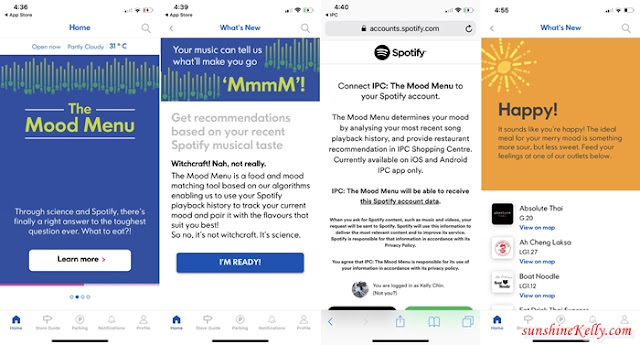 The Mood Menu mobile application is able to recommend the places to dine or drink at IPC based on my recent Spotify music playlist and mood. Really??? It’s not a witchcraft, its science! 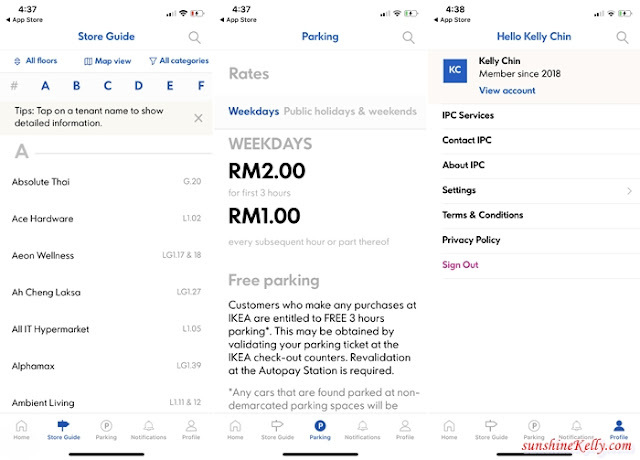 During CNY break I decided to catch up with my friends at IPC Shopping Centre, the mall recently had a redevelopment and I was introduced to this IPC app. To my surprise the app actually able to shortlist the restaurant that I like and helps me my friend to make better and faster decision on what to eat. In the nutshell, the IPC Shopping Centre mobile application is all you need when you are there. It contains informative details such as Store Guide, parking information, latest promotions, as well as members-only promotions for those who sign up for a profile within the application and also the innovative The Mood Menu that triggers my curiosity to download the app immediately. What is so unique about The Mood Menu? You know the IPC Shopping Centre mobile application is the first shopping centre app in the world that is developed in collaboration with music streaming giant, Spotify, to provide us with recommendations on places to dine or drink at IPC. The Mood Menu is a food and mood matching tool based on our Spotify playback history to track our current mood and pair it with the flavours that suit our taste. 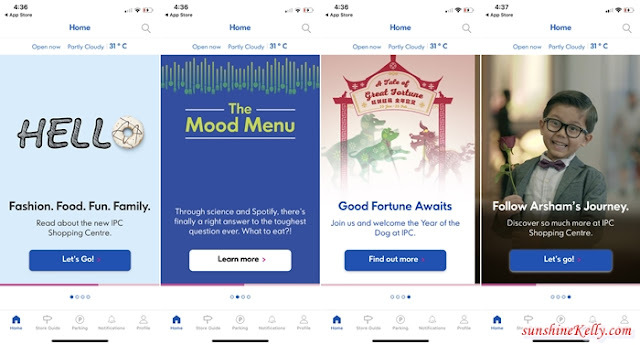 IPC Shopping Centre worked alongside world-renowned taste psychologist Professor Robin Dando of Cornell University to create ‘The Mood Menu’ - a food-and-mood matching tool based on a complex proprietary algorithm of human emotions and the effect on their sense of taste. According to Professor Dando’s landmark 2015 study published in the scientific journal Appetite, human moods have the ability to inhibit or accentuate sweet, salty, bitter, sour, or umami (savoury) flavours. IPC Shopping Centre mobile application is now available for download via Google Play Store and Apple App Store. Let’s start! I downloaded the app and sign-up, I can find all the useful information about IPC Shopping Centre in the app and store guide. Slide left and then head over to The Mood Menu, press I’m Ready then I connect the app to my Spotify account. Tadah!!! Here is the list of the restaurant the IPC: The Mood Menu app recommendations. OMG!!! I’m so surprise, how can an app able to read me like a book and know what I love to eat so well! To be honest there is no Thai songs or Hokkien songs on Spotify playlist. Absolute Thai, Ah Cheng Laksa, Boat Noodle, Eat Drink Thai Express and the rest are my favourite restaurants. There are so many restaurants and eateries in IPC Shopping Centre and I am glad that this app is able to suggest what I want. That’s so awesome and make it easy for us to decide what to eat. That day we went to Ah Cheng Laksa to satisfy my craving for Asam Laksa. Hey! ou too can check out The Mood Menu and see if its suits your mood or not! After the makan and chit-chat session, we also check out the mall CNY decorations, new stores, family friendly facalities and other choice of dining options too. I love to visit IPC, great to hv new menu app to shop around and eat nice nice delicious food.. This is something different. Never thought they will come out with something like this. I saw Ah Cheng laksa. Now you make me craving! Wow..sound great! Help people who blur what to eat . Hehehe. Never expected we can have that apps.. Very friendly user right? I want to try it soon! Ah Cheng Laksaaaaaaa!!! Tempat paling I suka makan. Dia punya laksa tu kaw gila. Hihihihiii..
Wahhh.. hebat ya the mood menu apps by IPC shopoing centre..mommy pon ada masalah bila ditanya, u nak makan apa..ermm ermm..untung ada apps yang bijak membaca fikiran kita..haha i need it! OMG, kelly, my dillema. always. moreover having 3 kids. gonna try this one day. Wah so good apps..sennag lepas ni no nid to stress nak makan apaaaa.. I didn't know about this new app that can suggest where to eat. Would like to download and use it because I always can't decide where to eat. Is a useful app. When you can't decide what to eat, just refer to the mood menu. Such a creative app. Want to download and try on it. Their latest upgrade is the best thing ever! And everything is super convenient now like this app...Like i dont have to drag my father around the whole mall to know what he feels like eating.